Local 537 consists of over 650 Members, Applicants, and Apprentices in the Hamilton, Brantford and Niagara Region of Ontario and represents Journeymen, Apprentices, Sheeters and Deckers, Roofers and Production Workers. The first recorded Charter in this area was granted to Local 61, Hamilton, on July 20th, 1899 and forfeited at an unknown date. We do know it was after 1919 because of an agreement signed between Local 61 and Local 205 of the Painters & Decorators in regards to skylights. Local 61, Hamilton, was chartered for a second time on April 12th, 1927 and forfeited September 21st, 1932. Local 560, Welland and Niagara Falls was Chartered November 15th, 1955 and merged with Local 537 Hamilton on April 9th, 1959. Local 424, Brantford was Chartered on March 1s, 1956 and merged with Local 537, Hamilton on March 10th, 1959. Local 568, Hamilton was granted a Charter for Roofers on October 29th, 1959. 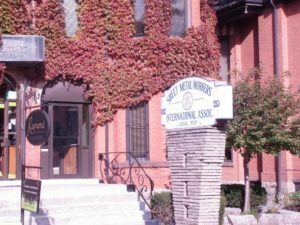 The Roofer members transferred into Local 537 on August 31st, 1972 and Local 568 was converted to a Production Worker Local and merged into Local 537 on April 1st, 1983.